How much do you know about video formats? While you are probably aware that videos come in different formats (such as AVI, MP4, MOV and so on) – do you really know what those formats are? More importantly, are you aware of which formats are compatible with the devices that you use? In most cases you may not actually worry about the video formats that you use – up until you come across a video that is incompatible with one of your devices. That can be inconvenient to say the least, which is why it helps to have a way to convert your videos between different formats so that you never run into that problem – and have a solution in case you do. The easiest way to convert video formats is with the help of Movavi Video Converter. It will let you convert your videos between any formats that you require, without any hassle whatsoever. In fact the only thing you need to do is add your video, choose a format, and click the ‘Convert’ button to begin. If you want you can even choose one of the presets to automatically set up its settings for a particular device or platform rather than having to choose the format manually. Convert audio and image files between different formats. Cut and combine video segments to trim out any unnecessary parts or merge clips together in a particular sequence. Improve the video quality either manually or automatically and rectify common problems such as shaky video segments. Create animated GIFs out of video clips. Grab screenshots from individual frames of video. Transform the frame and orientation by cropping or rotating the video. Insert text and customize it to create unique captions, watermarks, titles or subtitles. Extract the audio tracks from videos and save them as standalone audio files. Whether you’re looking for a video converter to MP4, AVI, WMV, MOV or any other video format, Movavi Video Converter will have you covered. 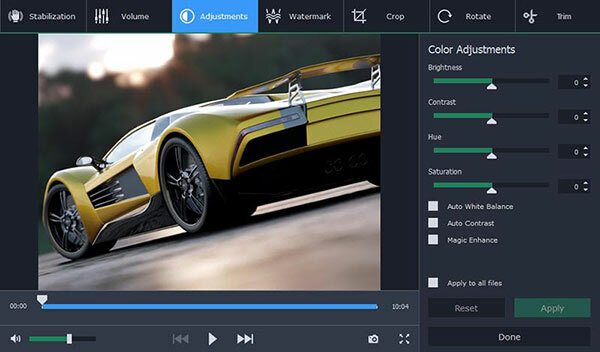 With all the extra features that it includes you will also find that you’re able to tweak your video in small ways and improve it – as well as creating other media from it too. Even if you don’t need to convert a video right now, it makes sense to keep it around as odds are you will at some point or other.